If you switch mobile phones very often then the first problem that you find when you change phones is to transfer the contacts. Surely, you can copy them manually by programming each and every contact to the new phone but if you have list of hundreds of contacts then this task will be too time consuming and the task will be terrifying. But one of the easiest and spotless way to transfer contacts from one device to another is to copy them in your SIM card and then insert that SIM card to the new device and import them. The mechanism of importing contacts from SIM cards varies from phone to phone and in this tutorial, we will try to cover most of the operating systems so that you can import contacts from SIM cards to any kind of mobile phone brands. The procedure are quite straight forward and require no special skill to implement them. Keep on reading to find out how to import contacts in various brands. If you are using an Android phone then use the following steps to import contacts from SIM card to Android internal memory. For other brands keep on scrolling and find out which brand you are using and use that technique. 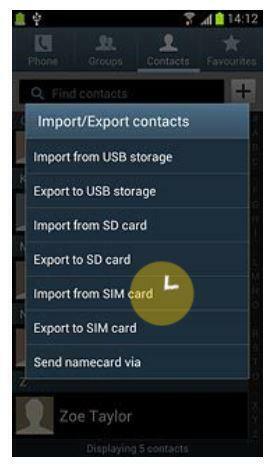 Use the following steps to import contacts from SIM cards in Android mobile phone. Step 1 : Take out the SIM card from the old phone and insert it to the new Android phone. Step 2 : Open Menu on Android phone. Find Contacts app and tap on it. Step 3 : Tap on the three dotted menu on the top right corner. From the options, tap on "Import/Export". Step 4 : Touch on "Import from SIM Card". Touch on "Phone" followed by "Select All". Tap on "Done" or the right icon from the top. The importing process will initiate. Wait until all the contacts are imported from SIM card to the phone. That's how you perform an import/export task on Android phones. Note: You can also import contacts from Gmail or from csv file. 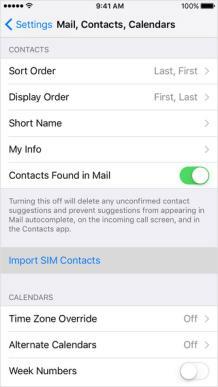 Remember that iPhones doesn't store contacts in SIM cards but if your SIM card already has contact lists from your old phone then apply the following procedure to import all the contacts from SIM card to Apple iPhone. Step 1: Remove the SIM card from old phone and insert to the new one. Make sure the SIM card fits in the iPhone or else you may have to cut it according to its size and shape. Step 2: Open main menu and tap on "Settings". Touch on "Mail, Contacts, and Calendars". Step 3: Tap on "Import SIM Contacts". Kindly wait patiently while the iPhone is importing contacts. 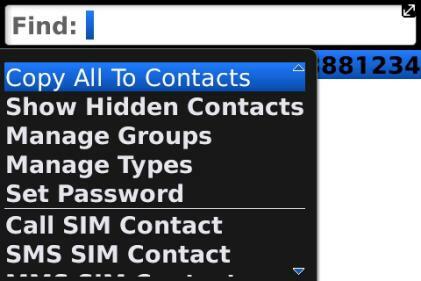 Step 4: Once done, go to the contacts application and check all the contacts list. It should be updated and the new contacts will appear automatically. Please note: This process will only work if your SIM card contains contacts from the old phone. IPhone doesn't store any contacts to your iPhone, so if you were using the SIM card in an old iPhone then this process will have no impact at all. iPhone saves all contacts in iTunes or iCloud and you will have to use those services to transfer contacts to the new iPhone. But if you are switching from Android to iPhone then this method will work flawlessly. Blackberry phones works a little bit differently than iOS and Android phones. But it is possible to import contacts from SIM card in Blackberry phones too. Simply follow this procedure. Step 2: From the menu, select "SIM Phone Book" and the SIM card will be loaded automatically. Step 3: Again click on menu and choose "Copy All to Contacts". Step 4: This should add all the contacts from SIM card to the Blackberry phone. Open contacts and you will be able to see all the previous contacts list. Hopefully you were able to import and save all contacts from the SIM card to your new device. The procedure varies from device to device but we have covered all the brands from Android to iOS to Blackberry. If you found this useful then don't forget to share it with your friends and families. Meanwhile, if you have easier method than this then don't forget to share that either.